About 20 years ago, before email and electronic delivery, out of a basement in Hillsboro, Wis., came the first issue of All the Dirt! Racing News. Although it started as a series of free handout “point sheets” and small news reports, it eventually became a subscriber-based newspaper, and today it is a full magazine published right here in the Chippewa Valley covering all the WISSOTA dirt racing tracks with over 27,000 Facebook fans and thousands of subscribers. So what is WISSOTA dirt track racing? Publisher Scott Hughes explains: “WISSOTA, a combination of WISconsin and MinneSOTA, is a group of race track owners (called promoters) who cooperate with each other to enhance the viability of dirt track racing throughout the upper Midwest and southern Canada.” WISSOTA racing began in 1981 when a cooperative effort by a handful of tracks in Wisconsin and Minnesota to stabilize by building a set of common rules so any driver could go to any track to race. Today, it encompasses over 50 member tracks in six states (Wisconsin, Minnesota, North and South Dakota, Montana and Wyoming) and two Canadian provinces (Manitoba and Ontario). Every driver who competes must have a license that includes several benefits, one of which is an All The Dirt! subscription, which for over 20 years has been “the vital link” between the individual tracks, their association (WISSOTA), and all of the drivers. Approximately 2,700 drivers are WISSOTA licensed in six different classes of race cars. There is one four-cylinder class and five V-8 powered classes and each class races at different speeds ranging from 65 to 100 mph and tracks ranging from one-quarter to one-half mile. The types of cars that race come in many varieties, each with its own particular set of rules. All of the cars, however, are dirt track racing prepared with full roll cages, protective bars, special tires, and drivers’ seats. WISSOTA racing is unique in the sense that it is highly unpredictable because of challenging track conditions that a dirt or clay surface provides as opposed to the typical asphalt surface. All The Dirt! has now been printed in Eau Claire at Leader Printing for over a decade and is celebrating its 20th anniversary as a publication this year. Scott and Jennifer Hughes, creators/publishers of All The Dirt!, met while they were still in high school. Scott had been a fan of dirt track racing since he was about five years old and holds fond memories from visiting the now defunct Eau Claire Speedway (just off Highway 37) where his brother worked pit crew. 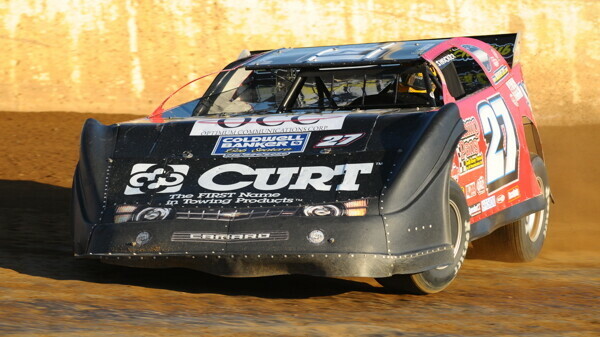 Having family in the business is what gave Scott his initial introduction into dirt track racing. After accompanying his brother in the pits as a kid and loving the experience of the “noise and speed,” he joined a pit crew himself and stayed with it through his college years at UW-Eau Claire. Although Jennifer’s racing background was fairly limited before she met Scott, after their encounter, much of their time since has been spent together at the track. The magazine began initially as a side project for the couple who both held other full-time jobs. Somehow the crisis was avoided and the issue came to life. Jennifer recalls the night of their debut issue proudly sharing, “I remember going to Marshfield Super Speedway in Marshfield ... with our first issue hot off the press. We handed out free copies to the spectators that night. It was an amazing feeling watching as everyone in the grandstands holding a copy and reading the issue for the first time.” After a couple of years of 70-80 hour work weeks, the couple made the decision to quit their “day jobs” and become full-time publishers, moving back to Eau Claire in 1996. The publication gained nearly immediate recognition and popularity, an essential aspect of that coming from their partnership with the WISSOTA Promoters Association to ensure that every driver in the region received a subscription to All The Dirt! when they purchased a competitor’s license. Dirt track race fans seem to be among the most passionate and dedicated of fans and in Scott’s opinion real “grassroots” level fans. With nearly 1,000 dirt tracks around the country, it is undoubtedly the most popular form of oval track racing despite the asphalt races that typically receive the hype and media coverage. Scott comments on the fans saying, "They get to see cars racing at fast speeds, sliding through the corners, bouncing off each other, crashing into each other, sometimes launching into the air and rolling over – right in front of their eyes. Dirt track racing is not mass-produced for an audience with a few-minute attention span. When you go do a dirt track, you get about three hours of intense action. The kind of stuff that gets your heart racing and adrenaline flowing." If you haven't seen a race before, you don't need to travel far. We have two tracks in the Chippewa Valley: Red Cedar Speedway in Menomonie and Eagle Valley Speedway near Jim Falls. Red Cedar runs on Friday nights and Eagle Valley runs on Sunday nights. Also close by are Rice Lake Speedway, St. Croix Valley Speedway near St. Croix Falls, and Mississippi Thunder Speedway at Fountain City. All of those are within an hour and a half of Eau Claire and all provide great entertainment for the whole family. To learn more about the magazine, visit allthedirt.com or check out the online edition is allthedirtonline.com.